This is a column I have written that should appear in the Arizona Republic sometime before next weekend. Jeff is a friend of the family. He runs a family-owned pest control business, Ranger Pest Control, that has been spraying our house for bugs since Elizabeth (and Jeff, for that matter) were kids. I have a great story to tell about the time Jeff tried to stop my mother-in-law from drinking a Coke contaminated by one of our dog's pee that I hope makes it to the blog someday. Anyway, Jeff also belongs to this group of military vehicle owners, and they have their big annual show coming up at the end of January in Peoria. I wrote this after attending one of their meetings, and interviewing Jeff about his personal experience and interest in owning a military vehicle. 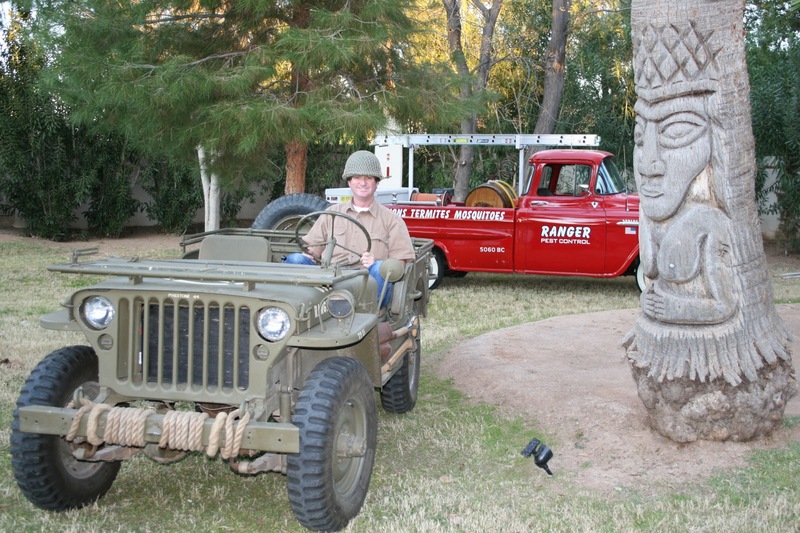 For twenty years, the Arizona Military Vehicle Collector’s Club (AMVCC) has held an annual show at the Arizona National Guard’s Papago facility in Phoenix. However, this year the show is moving to the Peoria Sports Complex on the weekend of January 28th and 29th. 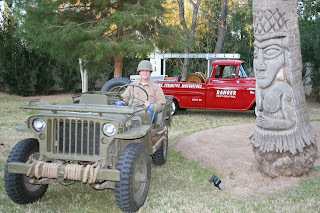 The 21st Arizona Military Vehicle Show is billed as the largest of its kind in the Southwest, and the new location will provide an abundance of space to display a wide variety of trucks, jeeps, motorcycles, armored cars, transports, and track vehicles ranging from WWI-era to Desert Storm, including an extremely rare “Jumbo” Sherman tank, which is making an appearance at this year’s show for the first time. Military vehicle collectors are an interesting bunch, as I found out when I attended a recent AMVCC meeting at the invitation of Jeff Abrahamson, a friend and the group’s treasurer. Not surprisingly, it’s an almost exclusively male pursuit, whose members mainly are former military themselves. For many of these people, restoring and showing military vehicles is their way of sustaining an important connection to their personal past, or keeping alive the history that they helped to make. The annual show is, in many ways, their best opportunity to share this passion with people of all ages and from all walks of life. Jeff Abrahamson, who lives in the North Glen Square neighborhood in Phoenix, has exhibited his vehicle for several years now. He acquired his WWII-era Jeep almost by accident, after a friend of his purchased the vehicle at auction. He planned to transport it to his home in Michigan, but had to temporarily park the vehicle at Jeff’s. Three years of seeing the Jeep sitting in his garage was enough to entice Jeff to offer to buy it from his friend and restore it himself. Little did he know that in doing so, he was stepping into an entirely new world of replacement parts, licensing and registration snafus, restoration work, M*A*S*H parties, trail rides, parades, and an idiosyncratic fraternity of collectors. He went on to relate a story another member told him about coming out of a store one day to find a family occupying his truck, playing with the buttons and knobs. When this person kindly asked the people inside if they wouldn’t mind leaving his vehicle, the response of the man inside was, “Why? I own part of this truck. My taxes helped pay for it.” While that person was completely wrong about that (these are private vehicles that have been bought at auctions or from private sellers), perhaps he inadvertently revealed something that helps explain the popular affinity for military vehicles like these. In a way, many of us do feel like we’re co-owners, maybe not of the vehicles themselves, but of the history they reflect. After all, these are the vehicles that once helped save the world from fascism. They’re the vehicles that stand for something great about us, reminding us that in beating back Hitler’s armies, we did something enormously important and necessary. Times have changed; we may no longer feel like we’re the undisputed good guys anymore, but we were once, and that’s a feeling we all want to own. The Peoria Sports Complex is located at 16101 N 83rd Ave, Peoria AZ 85282. If you can get to 83rd Ave, you'll find it on the east side of the street just south of Bell Road. If you go, don't forget to say 'Hi' to Jeff! So true about that Jeep, I'd take a picture of it if I saw it in a parking lot. Genuine Americana. But enough about that.... who did that awesome palm tree carving. Anonymous - According to Jeff, the guy who did his palm tree carving lived on 27th Ave, just south of Orangewood. You can see several carved palms out in front of his house on 27th if you look on the east side of the street. Don't know if the guy that made them still lives there though.